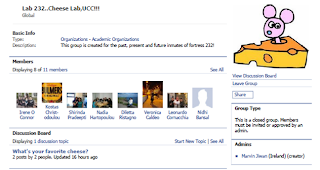 We have recently formed a Facebook group for current and (in particular) former members of UCC's Lab 232 (the home of cheese research on campus). I thought it would be a nice way to keep in contact with people who have now left the lab and moved on to the real world of cheese. If you would like to join, please go to Lab 232..Cheese Lab,UCC!!! on Facebook. We will not discriminate so even if you were based down the hall in Labs 227 or 230 (or even elsewhere in UCC), please feel free to join!